This music is dedicated to everybody who strives for unity and peace in the visible and the invisible world. 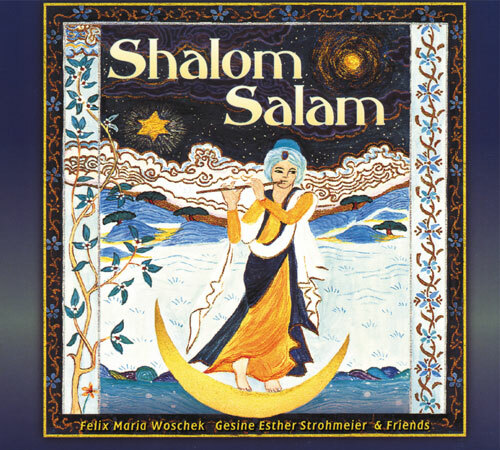 F. M. Woschek and G. E. Strohmeier have make the difficult attempt here to build musical and spiritual bridges between Judaism and Islam by tracing the common roots of these two great religions. The result is a collection of pieces of remarkable diversity, a huge musical rainbow. The best-known wazifa (mantras) of Sufism such as Bismallah or La Illaha Illallah are sung here to the accompaniment of deep drum-beats and the longing tones of flutes. It is the ecstasy of the love of God that invites us to join in with singing and dancing. Then the great Jewish prayer of unity sounds out the Sh’ma or a Nigun, a wordless song from the heart, accompanied by the pious violin, and finally an urgent prayer for peace between Arabs and Israelis: Shalu Shelom Yerushalayim. F.M. Woschek has plumbed the depths of his many-sided musical experience here and allowed numerous stylistic elements to flow together. He was assisted by, among others, the Turkish drummer Murat Coskun, the saxophonist Gesine Bänfer, and the violinist Harald Kimmig. F.M. Woschek has succeeded here in capturing the quintessence of Jewish and Islamic music without being untrue to his own style. „Fire sounds from the flute. It is the same fire of love that makes the wine boiling. Its melodies destroy those veils which disguise man´s memory of his home.